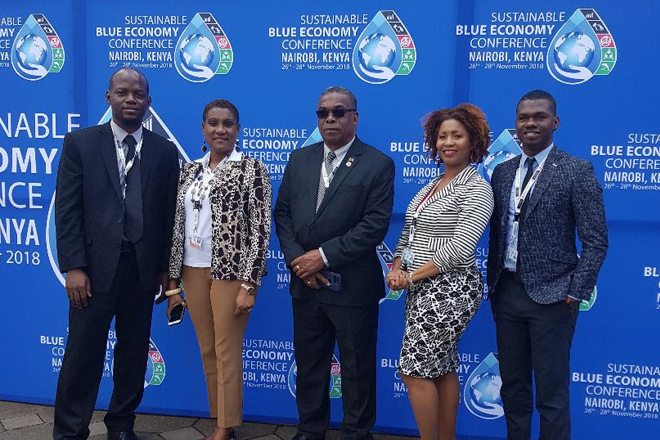 Earlier this week Minister of Public Infrastructure and International Transport, the Honourable Ian Liburd led a delegation to the first Global Sustainable Blue Economy conference in Nairobi, Kenya. During his speech at the leader’s commitment segment Minister Liburd reaffirmed that the government of St. Kitts and Nevis is committed to develop the blue economy for benefit of the citizens. He said the government has realigned the work programs of the marine institutions through legislative and policy support in order to meet the goals that it has set for the blue economy in providing economic opportunities for the people for the foreseeable future. Minister Liburd also held bilateral meetings with delegations from different countries in order to improve the level of cooperation between St. Kitts and Nevis and those countries. Minister Liburd was accompanied by Permanent Secretary in the Ministry of Tourism Carlene Henry-Morton, Director of Marine Resources, Marc Williams, Director of Fisheries in Nevis Lemuel Pemberton, Foreign Service Officer Sheldon Henry and Marine Management and habitat monitoring officer Tricia Greaux.